DietSensor as seen on NewsWatch on the Discovery Channel. 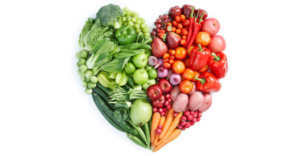 Tracking what you eat is the first step to developing healthy eating habits. Curious just how many carbs and calories are sitting on your dinner plate? 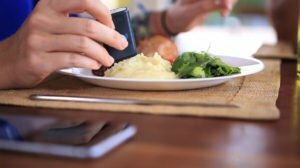 A new pocket-sized Bluetooth-enabled gadget called the SCiO promises to reveal the nutritional value of your meal by scanning its chemical makeup. From French startup DietSensor, and developed with the help of Consumer Physics, the device uses near-infrared spectroscopy (the analysis of how molecules interact with light) to determine fat content, carbs and more of food. It will hit the consumer market later this year. This year's Consumer Electronic Show in Las Vegas has shown us one thing, that we've firmly arrived in the future of the quantified self. Apps and products all promising to measure and collate certain data about your personal habits spewed the show floor. But one product in particular stood out to us amongst the mix. 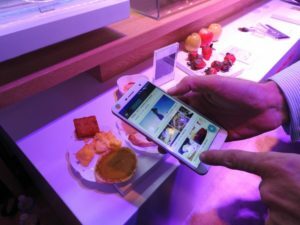 That's the new Diet Sensor app, which uses SCiO, the world's first pocket spectrometer, to instantaneously scan your food and give you it's nutritional value. Want to know exactly what’s in everything you eat, but just can’t be bothered with the endless measuring, calorie counting, and ingredient logging? This device might be perfect for you. 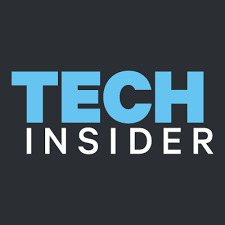 The official home for video from CES. 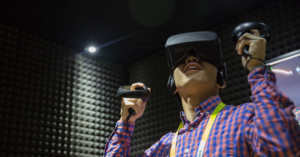 Everything from wearables and smart jewelry to smart pet collars and tension-relieving headbands are showcased at CES 2016. Watch this video to see products from DietSensor Cahnegat, Ashley Chloe, BioTrak Health and BlueSpark Technology. For those of you who count your carbs and calories, DietSensor is looking to make your life easier. The French-based startup has created a tool that scans your food and determines its nutritional value. The idea is that you can go out to eat at a restaurant or at someone’s home and still keep tabs on your diet…if you don’t mind holding up this gadget. 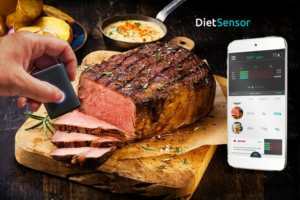 A CES Innovation Award winner, DietSensor is showcasing its product at the Consumer Electronics Show in Las Vegas this week. 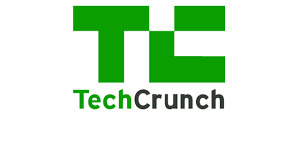 TechCrunch spoke to Remy Bonnasse, co-founder and CEO. Curious just how many carbs and calories are sitting on your dinner plate? This gadget scans the chemical makeup of food and reveals its nutritional value. Ever look at a plate placed in front of you and think, “How many calories is that?” DietSensor can tell you. This app tells people what they need to know in the absence of a nutritional label, and is perfect for people that have to monitor their diet. 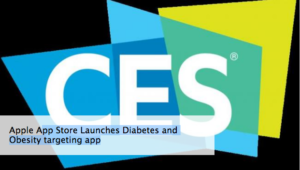 The DietSensor app was chosen as Best of CES 2016 Innovation Awards Honoree in the Software and Mobile Apps category. DietSensor is aimed at people with conditions that require them to keep a close eye on their diet. SCiO with DietSensor can be especially helpful to diabetics, or people with cardiovascular disease. Of course, those struggling to lose weight and athletes trying to hit the pinnacle of physical fitness can make good use of DietSensor. Thank you Aliya from Digital Trends for this article. Indeed the DietSensor app will launch next year, probably around the summer. One thing though to make it cristal clear, the DietSensor with SCiO is set at at $378.99 (Package Including 1 year DietSensor Ultimate license). 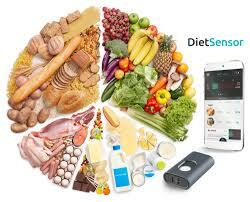 The DietSensor app is free if used without scan (with the 600 000 items declarative database). To use it with SCiO and access the algorithm DietSensor database, you will need to pay for a monthly Premium pack (the price is not set yet). You will be able to stop the Premium pack anytime and restart it later if you want. One last thing, if you have purchased your SCiO by another channel instead of dietsensor.com, it will work with DietSensor Premium Pack also. No worry. Dietsensor marks the beginning of the next generation of nutrition tracking tools. It is the first instant nutrition coach with sensors is able to tell within seconds the nutritional values of a food or beverage and give immediate advice, driven by evidence based medicine. 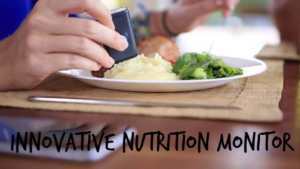 It is aimed at people who need to regain control of their daily food intake, especially those who are suffering from being overweight or with chronic diseases related to nutrition. This video has been recorded during the Medstartup days in NY on October 27th. New York, NY (PRWEB) November 10, 2015 -- DietSensor announced that it has been named a CES 2016 Best of Innovation Awards Honoree for the first instant nutrition coach with sensors. Products entered in this prestigious program are judged by a preeminent panel of independent industrial designers, independent engineers and members of the trade media to honor outstanding innovative design and engineering in some of the most cutting edge tech products and services coming to market across 27 product categories. DietSensor has been named a CES 2016 Best of Innovation Awards Honoree for the first instant nutrition coach with sensors, which makes it one of the 20 best digital innovations in the world for 2016!